Heat oven to 350°F. Cook and drain pasta as directed on package, omitting salt. Meanwhile, in 10-inch nonstick skillet, cook turkey, Italian seasoning, fennel, salt and pepper over medium heat 8 to 10 minutes, stirring occasionally, until turkey is no longer pink; remove turkey mixture from skillet. In same skillet, cook mushrooms, onion and garlic over medium heat 6 to 8 minutes, stirring occasionally, until vegetables are tender. Stir turkey mixture, cottage cheese and egg product into mushroom mixture. Spray 13x9-inch (3-quart) glass baking dish with cooking spray. Spoon about 1 tablespoon turkey mixture into each pasta shell. Place in baking dish. 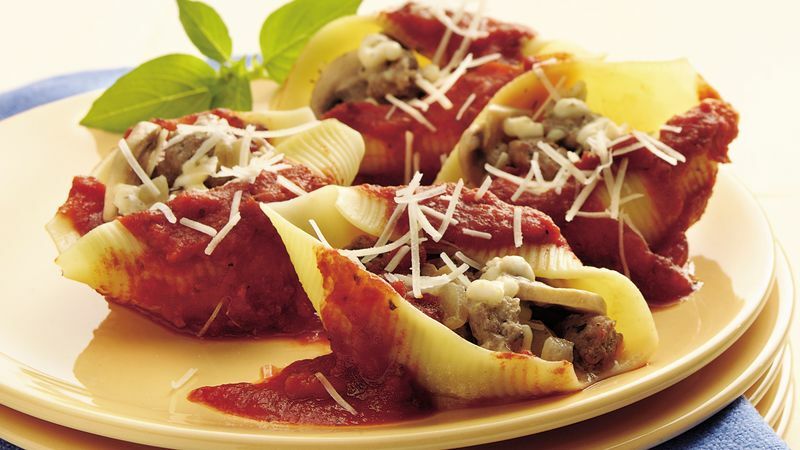 Spoon pasta sauce over shells. Cover with foil. Bake 20 to 25 minutes or until hot. Sprinkle with Parmesan cheese.